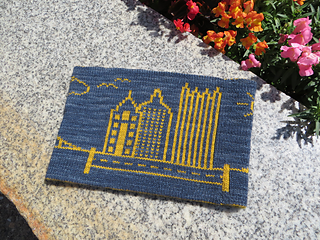 Pittsburgh, “The Steel City” or “The City of Bridges”, is the second largest city in Pennsylvania. 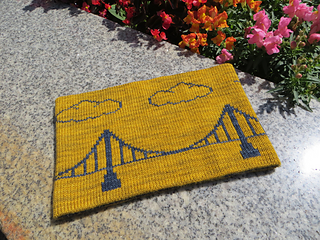 It is located at the confluence of the Monongahela and Allegheny Rivers which form the Ohio River. 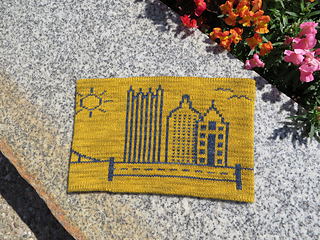 Pittsburgh is home to 446 bridges, 30 skyscrapers, 2 inclines, professional sports teams, countless universities and medical centers, excellent libraries, quirky neighborhoods and friendly people. 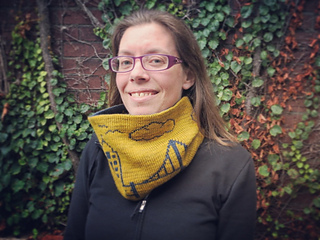 The Yinzer Cowl pays homage to this beautiful city. 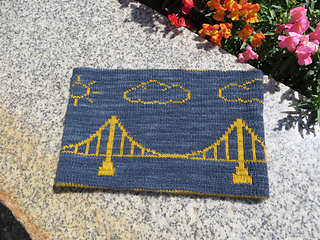 This cowl is double knit and fully reversible, featuring the “Dahntahn” Pittsburgh skyline; PPG Place, the Gulf Tower, and Fifth Avenue Place stand next to the Roberto Clemente Sixth Street Bridge. Flying high over the city are Louie and Dori, the two peregrine falcons who roost on the Gulf Tower. 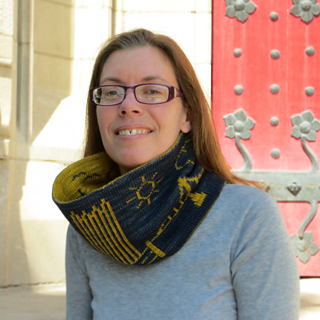 The Yinzer Cowl is currently available exclusively as a donation gift for the Steel City Fiber Collective’s Kickstarter.